Bytedance held a press conference for its first-ever social network product launch. The newly released social network product, Duoshan, is designed for close relationship circles according to the press. January 15th, 2019 / EqualOcean/ - Bytedance held a press conference for its first-ever social network product launch and the slogan of the press is “So Young (这是年轻的时代)” indicating that this is the era of the young. It has been rumored since the end of last year that the new product would still base on the short-video form but emphasize the social network feature comparing to its most popular app Tik Tok (Douyin in China). The newly released social network product is called Duoshan (多闪), a short-video based social network app within close relationship circles. According to other media, Bytedance has registered the domain name “flipchat.com”, and hence the product name released outside of China will be Flip Chat with a great chance. The Vice President, ZHANG Nan (张楠) claimed that the product is closely related to Tik Tok and is hatched by Tik Tok as well. Duoshan is defined as “short video + instance chat” for the 5G time and includes six functional modules: snap video, instant message, video red packet, stickers, a special module named Wo You Dian Xiang Ni (我有点想你) meaning “I am kind of missing you”, and World. The special module can be activated by sending a heart emoji to the person you want to reach, then all chat history will be recalled within app and user can re-connect with the person by starting a new conversation. The World module allows users to watch more video contents and provides a scenario for users to interact with old friends. 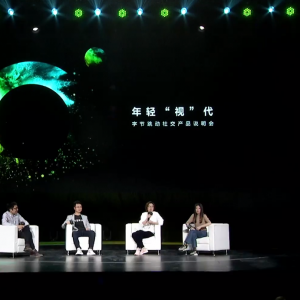 During the press, CEO of Toutiao CHEN Lin (陈林) stated that Duoshan is not aiming to compete with Wechat, the most-used social network app in China. In his opinion, Duoshan is not going to compete in a red ocean of social network but instead, it wants to discover a different social network. Line, WhatsApp, and Messenger might be competing for the same market, but Twitter, Instagram, and WhatsApp can co-exist peacefully with each other. Duoshan should be treated as in the latter case. However, Wechat has disabled Duoshan’s link sharing by the time this article published. The restriction is probably caused by a sudden and giant flow rush into a specific webpage and then automatically triggered flow-regulation mechanism of Wechat. The error page when accessing duoshanapp.com. Photo: Yingwei Fu for EqualOcean. Tik Tok as an interest-orient social network product is different from instant message apps. However, the communication need generated and accumulated during the usage of Tik Tok has concerned Tik Tok's CEO and the team for a considerable long time. Tik Tok allows users to have private talks within each other, but the bond between users is hard to last long as Tik Tok is not designed for communication but as a community for video sharing. Similar to Twitter and Instagram, people use them to share views, news, and nice photographs, and inter-users communication is not a focus for both and similar products. But the communication need suppressed in Tik Tok should find a place to be satisfied. Thus, the Tik Tok team hatched today-released product Duoshan to solve the communication need generated within the Tik Tok community. Duoshan inherits some properties and features from Tik Tok - both are interest-oriented networking and in Bytedance ecosystem. It is said in the press that Duoshan would be separated from Tik Tok structure in the future and operated as an independent product. Bytedance, as commonly known as Toutiao (the used name of the company) by the west, is a Chinese unicorn company valued at USD 75 billion. Its latest financing, series F, was co-led by SoftBank China, Primavera Capital, and KKR with a total amount of USD 4 billion. Bytedance’s most popular products are news-orient app Toutiao (今日头条) and Tik Tok. Tik Tok, as one of the most popular short-video based social network apps, current MAU (monthly active user) is between 400 and 500 million outside of China, while China’s MAU was more than 400 million and DAU (daily active user) excessed 200 million dated November 2018. The Tik Tok Chinees user image has shifted in 2018 comparing to the data in 2017 from top-tier cities to lower-tier cities. The increase of users resulted in enlarged portion of lower-tier cities signals that Tik Tok has made progress in market sinking – from top to bottom (or urban to rural). According to SensorTower, around 42% of Tik Tok’s revenue in Apple Store, nearly USD 1.5 million, was generated in the U.S., which increased 144% year-over-year(YOY) from October 2017. Chinese users contributed approximately 39% of the total, or USD 1.4 million. Tik Tok’s YOY revenue collected from global Apple Store surpassed USD 3.57 million. Another star product of Bytedance is the news-oriented app Toutiao. Toutiao's current MAU is approximately 260 million. The new push is generated according to Toutiao users’ reading behavior and interest. The customized push content is the core competency of Toutiao, which helps Toutiao to retain and gain active users. The algorithm embedded in Bytedance’ products are based on big data and deep learning - the more data accumulated, the more accurate the pushed content. Whether in Tik Tok or Toutiao, the customer stickiness is ranked top in app stores and thanks to Bytedance’ massive data accumulation and data-cultured algorithms and furthered optimizations.